Trevor Hudey gets up close and personal with the turn 6 brim. 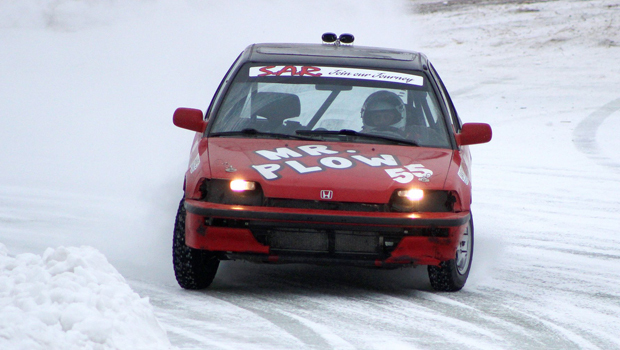 Steven Bradley, Winnipeg, MB (January 21) The Winnipeg Sports Car Club (WSCC) hosted the second installment of the 2018 Ice Racing circuit last weekend as they returned to the frozen surface of Murdock Water Ski Pond in north-east Winnipeg. Mother Nature has been treating the club well this year as temps rose to 0 degrees in the sunshine during Saturday’s test and tune. 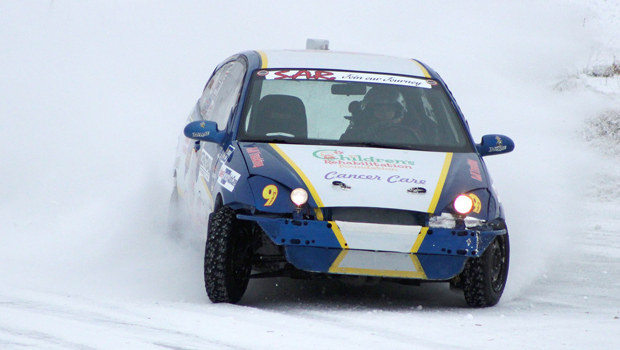 13 drivers took to the track this weekend in Ice Cross, Rubber and Studded divisions. Racers were given the same track as week 1, but raced in the opposite direction. Track prep staff also widened the track slightly as it was groomed to perfection. 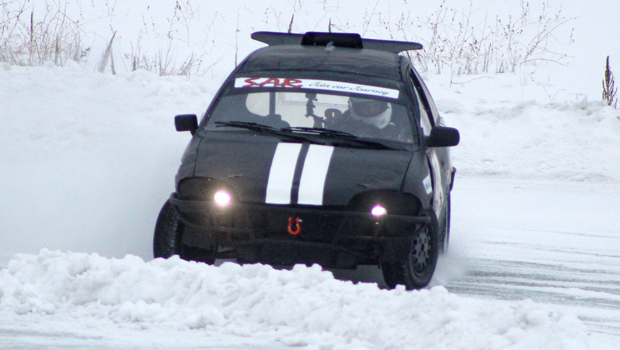 With only Rubber tires scrubbing the track surface on Saturday, it was extremely slick – testing the abilities of both new and experienced competitors. On Sunday, Al Marcoux made his first appearance of the 2018 season worth it – picking up 4 out of a possible 6 race wins in the Studded division. Points leader, Lee McRae, collected the checkers in the other 2 races. In the Rubber division, Damon Surzyshyn expanded his points lead after earning 4 wins. Mike Demchenko picked up wins in the other 2 races. In race 1, Al Marcoux led three Studded racers to green while Tim Gordienko started on point in the Rubber field. Marcoux held the point for the opening 2 circuits until McRae squeezed by entering turn 5 and took over the lead. Damon Surzysyhn quickly found his way to the front of the Rubber pack through the opening corners to take over the lead. 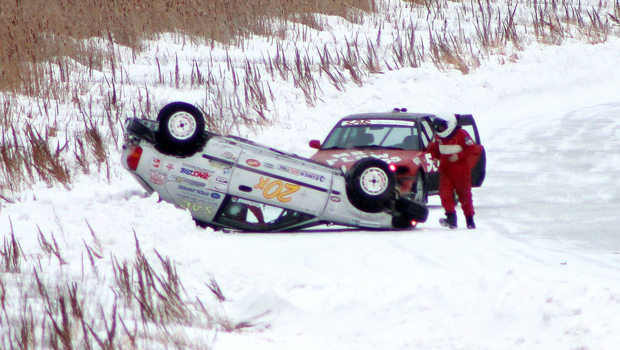 On lap 10, third place Studded competitor, Wayne Kehler took a nasty rollover while he was trying to navigate lap traffic. He lost his car sideways down the long entry before turns 1 and 2 and took a couple barrel rolls before coming to rest against the outer brim. Safety personal quickly made their way to the scene to find Kehler was not injured. With time running out, officials called the race and McRae was awarded the win. Unfortunately, that would end Kehler’s day. Surzyshyn led every lap and was given the win ahed of Morris Drysdale. 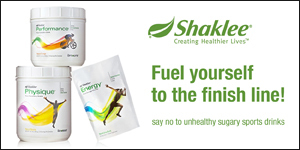 Gordienko finished third ahead of Trevor Hudey and Mike Demcehnko. In race 2, Marcoux led the pair of Studded competitors to green while Surzyshyn split the front row of Rubber racers to move from third to first in the opening corner. McRae made a pass on Marcoux for the lead entering turn 5 and held the point for the entire race. McRae collected his second consecutive win of the day. Surzysyhn opened some distance on the Rubber field to pick up his second win in a row ahead of Morris Drysdale. Tim Gordienko, Trevor Hudey and Mike Demchenko rounded out the top 5. In race 3, Al Marcoux once again started on the pole – this time managing to hold off Lee McRae through the early laps of the Studded field. Mike Demchenko led the Rubber competitors early as a battle for second was taking shape between Jared Halpin and Damon Surzysyhn. Marcoux was followed closely by McRae, but on lap 12, McRae began having alternator issues – forcing him to the pits early. Marcoux collected his first win of the season. Demchenko sailed to an easy victory ahead of Surzysyhn who got by Halpin to win the battle for second. Tim Gordienko and Trevor Hudey finished in the top 5. In race 4, Lee McRae used the pole to lead Al Marcoux through the opening laps of the Studded race until Marcoux used lap traffic as a pick on lap 8 exiting turn 2 to take over the lead. In the Rubber field, Damon Surzysyhn once again threaded the front row to jump from third to first and move to the point. Jared Halpin passed Mike Demchenko for second spot exiting turn 2 on lap 4. 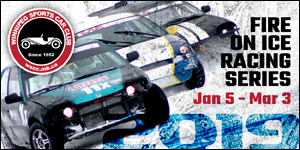 Nothing more changed as Marcoux edged McRae at the finish line to grab his second win in a row. Surzyshyn collected his third win of the day ahead of Demchenko. Halpin, Gordienko and Hudey rounded out the top 5. In race 5, Lee McRae led Al Marcoux to the green in the Studded division while Jarden Halpin used the outside front row to take control of the lead in the Rubber division. On lap 3, McRae and Marcoux split the Rubber leaders as they were lapping them in turn 5 – McRae chose the outside line and Marcoux was left with the inside line. Marcoux’s inside line worked best as he powered by both sets of leaders to take over the lead. On lap 7, Mike Demchenko completed a pass on Halpin exiting turn 2 for the lead. 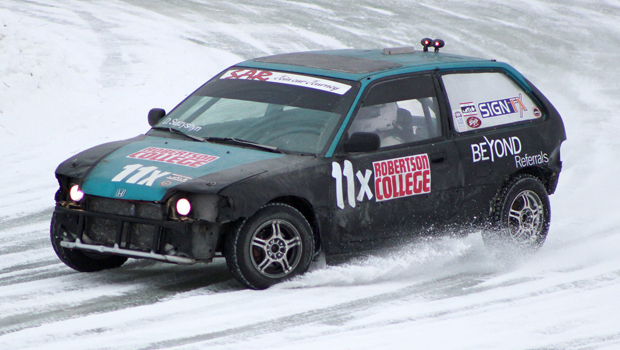 A few laps later Halpin scrubbed off some speed after getting into the snow brim – allowing Damon Surzyshyn to climb into striking distance. 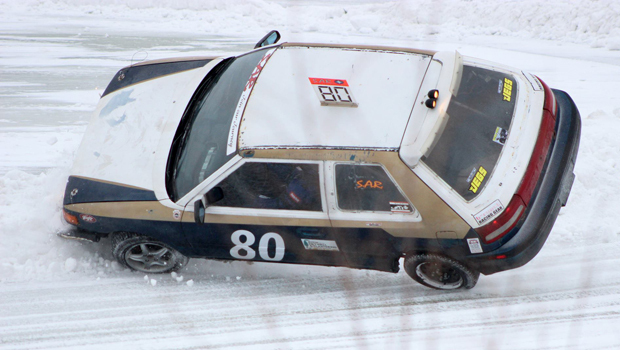 As the race wore on, Marcoux was under major pressure from McRae, and managed to cross the finish line under a car length ahead of McRae for his third win of the day. Demchenko held on the collect his second win of the day ahead of Halpin and Surzyshyn. Gordienko and Hudey finished with top 5s. Wayne Kehler comes to rest on the straight away after a couple nasty barrel rolls. In race 6, McRae used the pole to lead the Studded race early while Damon Surzysyhn’s outside front row starting spot proved valuable to lead the Rubber field through the opening laps. The Rubber field lost a competitor when Trevor Hudey took his ailing car to the pits on lap 5. McRae surrendered the lead on lap 7 when he fell off the pace in what looked to be suspension issues. McRae took his car to the pits and Marcoux easily navigated his way to his fourth win of the day. Mike Demchenko moved Jared Halpin back to third position after a pass exiting tun 2 – and began racing down Surzysyhn for the lead. Surzysyhn managed to keep his car up front and collected his fourth win of the day. Demcehnko finished in second ahead of Halpin and Gordienko. Wow, what a comprehensive race report! Great job, Mr. Bradley! Beautiful photos, to boot.